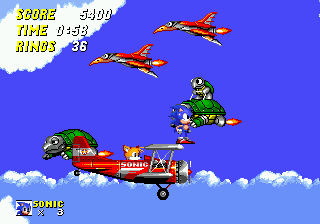 The sky theme occurs in the clouds, with Sonic sometimes riding the Tornado. This theme first appeared in Sky Chase Zone in Sonic the Hedgehog 2. In some levels with this theme, players may control Sonic, Tails, and sometimes Knuckles in the Tornado to battle Eggman's forces in the sky. There is no land in these levels, so the Tornado is the main mode of transport. These levels often occur later in games as the player approaches the airship fleet of Dr. Eggman. Levels that take place directly on an airship exhibit the flying fortress theme. Pages in category "Levels with a sky theme"